As a result of analyzing 6 drowning accidents that took place at the National Park during the summer season (July~August) for the last 5 years (2013~2017), it turned out that 5 cases(83%) were due to swimming after drinking. In general, if you drink alcohol, your heart beats faster and your veins are dilated. If you go in the cold water at this moment, the dilated veins are rapidly constricted, overloading the heart and it may cause a heart attack. For safe swimming in the water during the summer season, please do prior warm-up exercises and observe the basic safety precautions as well as abstaining from drinking. The valleys in the National Park have low water temperature and the exact depth is unknown. You should swim around the edge of the valleys since whirlpool phenomenon occurs in some sections. In case of seaside(beach), you should confirm information regarding risk factors such as tide pools, offshore currents, parting of the sea ways, etc. in advance. In addition, since unexpected heavy rain or shower may fall in the summer season due to mountainous geographical features, you should always be cautious about the weather conditions. If special weather reports such as issuance of heavy rain watch is issued, stop swimming in the water immediately and actively follow the control. We, the Korea National Park Service, selected 21 major valleys of the National Parks from all over the country including Taean seashore and 173 beaches as subjects for priority control and have been managing them intensively for the safety accident prevention of swimming in the summer season. In the afternoon when it is a vulnerable time for safety accidents, dispatch of patrol units will be concentrated in the subject area for priority control, and in addition to installation of rescue equipment such as nets for regulating people from entering water, safety lines, tubes, etc., please keep in mind that visitors will be regulated and safety precautions promotional materials will be kept. Make sure to do warm-up exercises to prevent cramps in your hands, feet, etc. and wear a life vest before swimming. Before entering the water for the first time, go in the water after immersing your body in water starting from the farthest part from your heart (in the order of legs, arms, face, chest, etc.). If you get goose bumps and when you feel your skin being pulled during swimming, wrap your body to keep warm and take a rest. ※ In this case, pay special attention since there are many significantly dangerous cases where you get a cramp in the leg or get muscle cramps. Places where the depth suddenly gets deep are especially dangerous since the depth of the water is not constant. Anyone who doesn’t have any life-saving experience should refrain from reckless rescue prior to safe rescue. 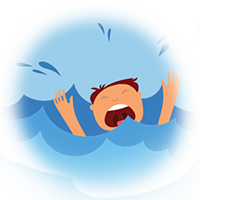 If you find someone drowning, shout to inform your surroundings (immediately call 119) and do not recklessly jump into the water if you are not confident in rescuing. Even if you are confident in swimming, perform safe rescue using the surrounding objects(tube styrofoam, pole, etc.) so far as possible. Do not swim if you are in bad health, hungry, or right after eating. Do not conduct unreasonable behavior by showing off your swimming capability. Do not swim for a long time and do not swim alone in the lake or river.